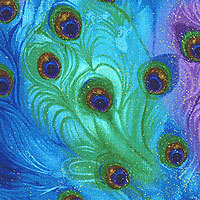 Larger feathers are about 3", from the 'Delilah' collection by Quilting Treasures. "Thank you! My first purchase has arrived, it is beautiful. Thank you thank you soooo much." "To all you quilters out there around the world, I would like you to know that I have been dealing with eQuilter for quite a while now and have always found them to be extremely reliable,..."